Escalation occurs when competing actors “one up” each other – rather than set absolute levels of behavior, each actor observes the actions of a competitor and responds relative to another. This can lead to a damaging spiral if the escalation involves violence, hate, and negativity. Competitors engage in price wars where each tries to undercut the other, until they are both pricing just above costs and making much less than they would have had they not undercut in the first place. Gossip and noise levels in groups of friends can escalate. Political candidates escalate the amount of campaign money spent on negative publicity of their opponents. After Mitt Romney successfully fundraised large sums of money from members of the financial sector, Obama decided to move away from his traditionally grassroots based fundraising strategy and also raise money from individuals in finance as well. Now both politicians must be tight-lipped about criticizing the industry that their friends are a part of. In the 90’s rappers would have “beef” with each other, creating East Coast vs. West Coast rivalries that escalated into hate-filled lyrics and violence. 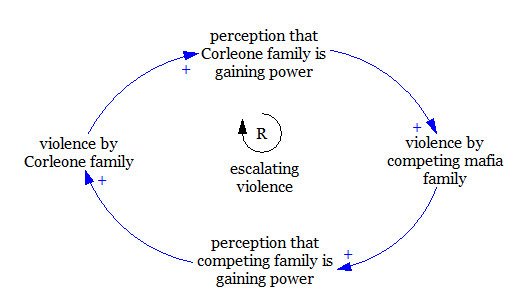 Escalation occurs because there is a reinforcing feedback loop between two or more actors. This can lead to exponential growth, pushing the actors quickly to their limits. Eventually, someone or something will break down and end the escalation. One way to escape is for every one involved to agree to stop. Companies recognizing that undercutting prices leads to less profit for all will play nicely and stop undercutting each other. The Amazon publishers, after seeing the unreasonable prices of their textbooks, will redesign their algorithms to avoid future situations like this. Because it is difficult for actors within a system to completely stop something they have been engaged in for some time, it may require a third party to enforce an end to escalation. For example, government can set limits on the amount of campaign spending money politicians can use. Parents can enforce time out rules if arguments between siblings escalate out of control.